Well, I’ve been meaning to do this for some time: i.e., post a list of individuals buried at Union Cemetery with hyperlinks to photos of grave markers there that I took a few years ago. 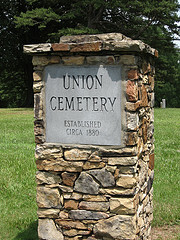 Briefly, Union Cemetery is probably the most important burial site for African Americans in Guilford County, it being the final resting place for many of Greensboro’s most prominent African American residents from the late 19th and early 20th centuries, including those of Old Warnersville. It is located on the east side of the 900 block of South Elm Street. I will continue to work on photographic documentation of the cemetery and will be adding additional links in the future. Many, if not most, of the graves at Union Cemetery are likely unmarked. If you’d like to learn more about the problem of unmarked graves there and in other old African American cemeteries, take a look at this post from last month. The following list was first published in Family Burying Grounds and Abandoned Church Cemeteries in Guilford County, N.C., and Immediate Environs, compiled by O. Norris and Rebecca H. Smith (1978). A few emendations have been made where additional grave markers have turned up since the Smiths’ work was completed. It is also possible that some have since disappeared. Bullock, J. Lot Jr. Aug. 26, 1905-May 24, 1906. In yet another neat DNA story, scientists have recently used the building blocks of life to help identify the remains of the famous Renaissance Polish mathematician and astronomer Nicolaus Copernicus (1473-1543), who, with his theory of the heliocentric or sun-centered universe, is often credited with starting the scientific revolution. Alas, poor Copernicus died shortly after De revolutionibus orbium coelestium (On the Revolutions of the Celestial Spheres), his seminal work, was published. During Galileo’s day, when findings with the telescope began to add weight to Copernicus’ ideas, On the Revolutions was deemed heretical by a then very conservative Roman Catholic Church. But with no little irony (at least in view of the Church’s later action against the work), Copernicus was buried on sacred ground beneath the floor of the cathedral of Frombork, located in Northern Poland. Long since rehabilitated by the Church and honored for his landmark contributions to modern science, there had periodically been efforts to locate his remains there, but these had failed. Furthermore, previous efforts to locate his tomb had made it clear that it would be difficult to distinguish Copernicus’ remains from many other anonymous burials. Nonetheless, in 2005 some bones were located which looked especially promising, since a facial reconstruction as well as the presence of some scars on the skull seemed to match up nicely with surviving contemporary portraits. But the excavators still weren’t absolutely sure they had found the famous astronomer. Anyway, analysis established that some of the hair DNA matched the DNA from the remains recovered at Frombork and voilà: proof that Copernicus’ remains had definitely been found. And so it was that just a few days ago a man once branded as a heretic by the Roman Catholic Church was honorably reinterred. If you’re interested, Greensboro Public Library has a number of books on Copernicus, including: Copernicus by Jack Repcheck; The First Copernican: Georg Joachim Rheticus and the Rise of the Copernican Revolution by Dennis Danielson; Uncentering the Earth: Copernicus and the Revolutions of the Heavenly Spheres by William T. Vollmann; and On the Shoulders of Giants: The Great Works of Physics and Astronomy, edited, with commentary, by Stephen Hawking. We’ve also got some juveniles such as Copernicus: Founder of Modern Astronomy by Catherine M. Andronik and Nicolaus Copernicus: The Earth is a Planet by Dennis Brindell Fradin. Just a brief note that North Carolina’s unemployment rate fell in April to 10.8%, according to today’s News and Record. This was down from 11.2% in February. There are also hopeful signs for a downward trend nationally, as MSNBC reported today that April jobless rates declined in 34 of the 50 states. However, the national rate still remains very high at 9.9%, and it’s expected to be years before we get back even close to full employment. If you’re out of work and looking for a job, please remember that Greensboro Public Library has plenty of resources which may be of help. We’ve just recently hired a new job counselor, Ms. Erica Saunders, and you can check out our online resources here. How well adjusted are our children when it comes to money? Statistics show that young people are buying more and accumulating more debt than ever before. Future Cents is a grant funded project that will help youth and their parents learn budgeting, checking, saving, investing and more. The goal of Future Cents is to help youngsters develop good money skills. Too often older teens get a first job or obtain student loans for college and they have little knowledge of managing their money as they become adults. 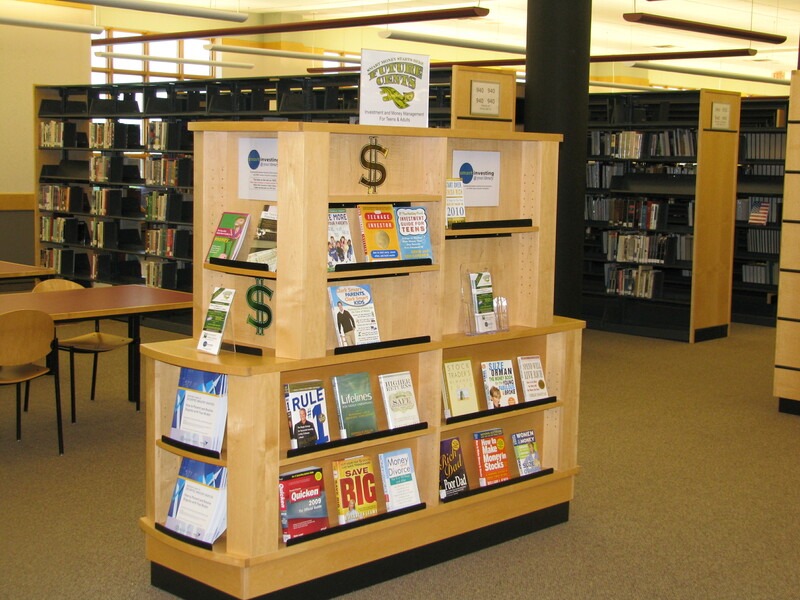 The website myfuturecents.com provides details on programming and resources to help teens and adults learn more about financial responsibility. The programming begins June 12 with 2 sessions: Credit 101 for teens and Understanding Your Credit Report for Adults. As Future Cents develops we hope to build a program that is attractive to teens and provides them with the skills to become independent and responsible adults. This project will run through December 2011 so you will see more as resources and programs are added. Community involvement is key for the success of this program. I am pleased to announce that the Black Achievers group at the Hayes-Taylor YMCA will work hard this summer to learn the skills that the Future Cents curriculum offers and go out to mentor younger kids in learning good money habits. This is just one way that the community is coming together to make Future Cents a success for young people. Could DNA Analysis Help Solve Mystery of the “Lost Colony”? I suppose just about everyone has heard of the famed “Lost Colony,” which was one of the first attempts by the English to settle the New World. Located just off North Carolina’s coast on Roanoke Island, the story of the colony began in 1587 when the famous mariner Sir Walter Raleigh, who had received a charter from the Crown to establish a colony in North America, organized an expedition to be led by a friend of his named John White. It is believed the colonists embarked for their future home in North America from Bideford, Devonshire, located on England’s southern coast. The Roanoke Island settlers (perhaps 150 in number) got off to a good start, but by the end of the year they were running into trouble with Native Americans in the region, and White left for England to get help. Delayed by war with Spain — 1588 was the year of the ill-fated Spanish Armada — White was unable to return until 1590, and when he at last did, he found the colonists had mysteriously vanished. The only clue to their fate was the name of the tribe “Croatan,” carved near their abandoned fort. To this day no one knows what happened to the colonists. But one theory is that they were assimilated into one or more of the local Native American tribes. So, check out this neat story about how the current Mayor of Bideford, Devonshire, wants to try to use DNA analysis to link descendants of the colonists from his town, as well as elsewhere in England, with possible descendants in the United States. If you’d like to read more about the Lost Colony, Greensboro Public Library may have some books for you. Our more recent items include: A Kingdom Strange: The Brief and Tragic History of the Lost Colony of Roanoke by James Horn (this book was published just this year, by the way); A Voyage Long and Strange: Rediscovering the New World by Tony Horwitz; Roanoke: Solving the Mystery of the Lost Colony by Lee Miller; and Lost Colony of Roanoke (History Channel video). We also have lots of juveniles on this topic, and I’d be remiss if I didn’t mention the play on the legend of the Lost Colony by famous North Carolina playwright Paul Green, which of course is still performed at Manteo each summer and remains our state’s most popular outdoor drama. Opening night is later this month, by the way. Just a brief note here on an interesting article concerning in situ efforts to preserve artifacts from the wreck of Blackbeard’s flagship, the Queen Anne’s Revenge (QAR), which was discovered in 1996 in waters off North Carolina’s Beaufort Inlet. The notorious pirate — whose real name was Edward Teach — had run the ship aground on a sandbar and abandoned it just a few months before his violent end came in late 1718 at the hands of a small force organized by then governor of Virginia, Alexander Spotswood. The wreck of the QAR is probably North Carolina’s best known underwater archaeological site — though I suppose the famous ironclad U.S.S. Monitor would give it a run for its money. Preservation of artifacts from the QAR while they still lie upon the ocean floor involves an experimental process that reverses the electrochemical process which corrodes iron in seawater. Initiating the conservation efforts on site should help improve efficiency. Many thousands of artifacts have already been recovered. You can learn more about North Carolina’s pirates and Greensboro Public Library’s resources on them in this previous post by our North Carolina Librarian Helen Snow.